The QSS-3501i PLUS, QSS-3501 PLUS, and QSS-3502 PLUS,are innovative additions to the highly popular QSS-35 series. The new QSS-3501i/3501/3502 PLUS is a user-friendly, efficient, cost-effective minilab system that combines the same basic features as the QSS-35 series with even more features that meet a wide variety of customer needs, such as the ability to form a network connecting multiple printers, and a versatile layout in which the operation section (PC, monitor, scanner etc.) can be separated from the printer. High quality print engines Noritsu Koki’s laser engine is used for the QSS-3501/3502 PLUS and an iBeam engine is used for the QSS-3501i PLUS. Both produce vivid, high quality prints of 300dpi. You can choose which side to operate the machine from, and the components can be separated and placed in various layouts, giving you more freedom to use the system in a way that best fits your available floor space. Furthermore you can also adjust the height by raising the table up to 20cm. Noritsu AccuSmart technology enables you to easily portray the natural beauty of the scene as viewed by the photographer when the picture is taken. This advanced technology not only provides superb quality for well photographed images, it also applies appropriate correction to less-than-perfect shots, resulting in extremely high quality prints regardless of the image source. to add a scanner, and instead use the QSS-3501i/3501/3502 PLUS as a stand-alone printer. The EZ Controller gives you the ability to easily perform many important functions such as PJP, value-added print creation, order management, and image correction. Furthermore, pictures are used to explain many of the instructions for start up checks and shut down checks, and warning messages are easy to locate and read. The colorimeter is built into the processor. This enables the setup print to be automatically inserted into the colorimeter after it comes out of the dryer unit, eliminating the need for manual operations. Also, the QSS-35 PLUS series has a new option called the “Control Strip Auto Loading Unit” that automatically processes control strips. LED lamps on the order sorter (Standard for QSS-3502 PLUS. Option for QSS-3501i/3501 PLUS.) are used to indicate which orders have been interrupted and which print trays the interrupted orders are in. When purchasing a QSS-35 PLUS minilab you can specify a rapid processing system which uses specified chemicals to achieve a reduced processing time, opening the door for an on-the-spot print service where the customers can drop off their media and pick up their prints a single visit. Note: Only specified chemicals and paper can be used. The standard maximum paper advance length is 610mm, and this can be extended to 914.4mm if you add an option, making it possible to provide a wide variety of print services. The dual and triple magazine systems enable labs that make various size prints to set multiple paper sizes at the same time. Magazine changes are quick and easy. 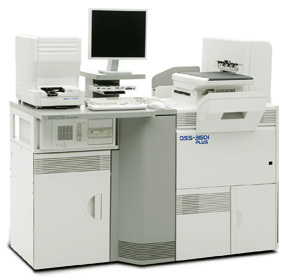 The QSS-35 PLUS series supports the MD-2 Unit, Bravo II/Rimage CD writers, DVD writing and many other options to provide a scalable system that allows you to add new services as needed. The film processor (QSF-T15) and the scanner (LS-600/LS-1100) can be combined into a single unit enabling the film to be automatically fed into the scanner as it comes out of the processor. This all-in-one configuration automates the entire process from 135 film development to printing, enabling unattended operation. NoteOne pass processing is only possible with 135 film. Capacity calculated according to our criteria. The actual capacity you achieve may be different.